Through every mountain high and every valley low, God reveals Himself to be true to His Word and promises. I choose to trust Christ daily, especially during seasons of turbulence, whether in my personal life or throughout the world. Trusting Christ reminds me that I cannot be a true follower without hope. My entire faith is based on the hope I’ve read about in Scripture. Time after time, I have found that difficult situations reveal our character and the faith we profess in Christ. The reality is, until Christ returns, His promises are a continuous fountain of hope that connect us to God. The faith we profess in God through Christ and the help of the Holy Spirit is only as real as our relationship is with the living God. Brothers and sisters, as a person of color, a woman, a person of lower socioeconomic status, fatherless, and an undocumented immigrant, it was excruciating to see myself through the eyes of this world: a cursed human being. That is, until I learned my true identity. As a human being created in the image of God, I was wonderfully and fearfully made. Above all other labels, I am a child of God. Nowhere have I have found greater hope and courage than in our Lord and Savior Jesus Christ. God endlessly reveals His tender mercies, which are new every morning – Hallelujah – grace, and love for all that call out to Him. Interestingly, the difficulties, challenges, and pain I have faced have revealed God’s abundant love, faithfulness, and provision in my life. I leave you with God’s Word, from where my hope has been strengthened. Adriana Mondragon-Hill was born in Guerrero, Mexico, and came to the US with her mother at the age of 5. She graduated from Biola University (in CA) with a BA in psychology. Adriana earned her MA in psychology from Chapman University (in CA) in 2009. 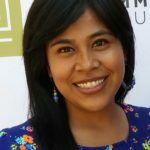 In 2012, as a DREAMer, Adriana became a DACA recipient and was able to begin pursuing her license as a Marriage and Family Therapist.